Munyana is a round the world Motor Sailor. 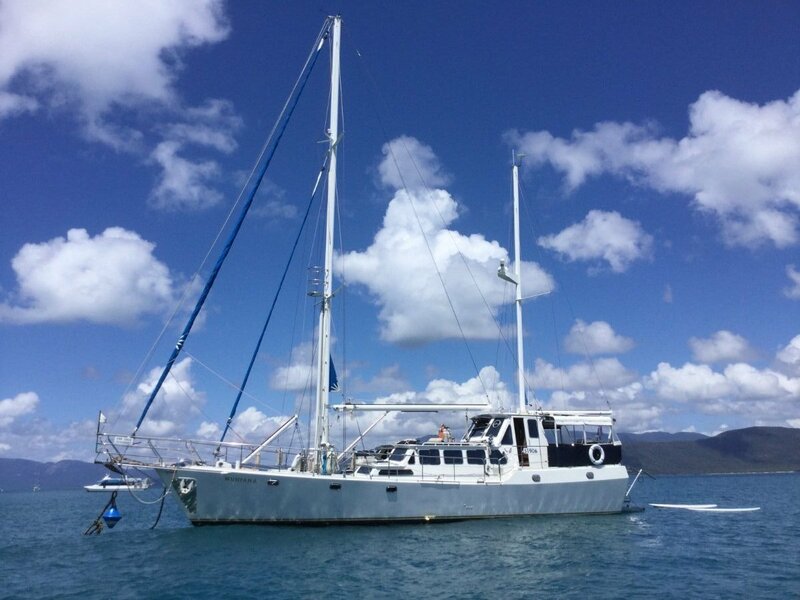 She is well maintained and ready to go..
We have spent the last 16 years sailing the East Coast including 6 years in SE Asia. It is now time for us to become land lubbers and it is with great regret that we have decided to put her on the market,, the next owner can expect to have many great adventures as we did. She needs to be seen to be appreciated. Honda 20 Hp 4 stroke new. Boom Tent, Clears, Window shades and Aft deck shades. Excellent Cover for sun protection. Stateroom with King size walk around bed. 1 cabin with 2 bunk beds, 1 cabin with 4 bunk beds. 2 internal 1 Duck board shower all with Hot and Cold pressured water. TV, DVD player, CD radio with USB port. Statesman, saloon and guest cabin. Well organised, gas stove with oven microwave, built in refrigerator, double bowl sink, booth seating on starboard side and lots of cupboard space. Underfloor storage. Citor Reverse Osmosis 100 litres per hour. 25 litres runs by engine or 240 volt. Muir Thor hydraulic anchor winch. Anchor 100 pound Mason CQR. 100 meters 13 mm chain. Engine driven Jabsco, 2 x Electric Rule 2400 GPH 1 x manual pump. FFE intergrated Fire suppressing system. Victron Inverter Carger 24/5000/120.8 Solar Panels with MPPT Tri Star Solar Charge Controler. Shore power isolating transformer. Thompson front loading washing machine incorporating tumble dryer. ICOM M127 HF Radio. ICOM VHF Radio. AM/FM JVC Radio Cassette. JRC GPS Colur Fish Finder Depth Sounder. Furuno GP35 GPS. JRC JMA2254 Radar. TMQ AP4 Autopilot. Navman digital depth sounder. Brooke's & Gateshouse Hornet Sailing Monitor Wind and Boat speed intuments.. Vesper AIS Watchmate. Sea Bis 3 x Stray Current Detctors. 1 x Genoa 1 x Staysail, 1 x Main (all 3 new) 1 x Mizzzen, 1 x MPS. 18 meters Alloy Main Mast and boom with boom vang. 15 meter Alloy Mizzen Mast and boom. Barlow 2 x 36 primary, 9 x 27 Halyard/sheet. Muir Thor Hydraulic Anchor Winch. Munyana is designed to provide the ultimate in luxury and comfort for Bluewater Cruising, when you see her you will be impressed by her large size and power and be surprised how easy she handles by two people, she has everything needed for extended Cruising. The wheelhouse offers both protection from all weather and added security. The aft deck has a teak table with seating for 10 people.